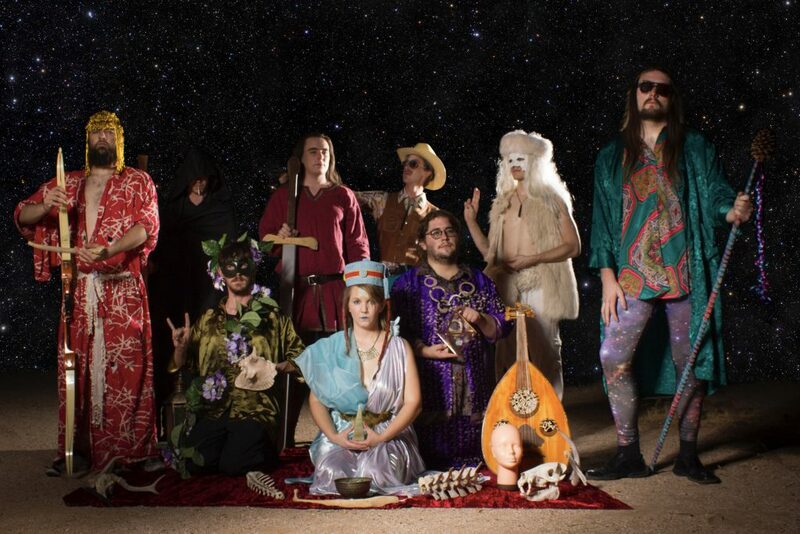 For one reason or another, Jerusafunk‘s celestial path has brought them to dwell amongst the greater PHX area. The band, founded in 2010 by Chris Del Favero (guitar) and Jessie Demaree (clarinet), originally began in Flagstaff, but the pair bounced around South America for a few years before coming to the Valley of the Spun. But after all this time, they haven’t released an album—until now. “The Hierophant” also the title of their new album, was definitely on the table in 2010 for the ten-piece ensemble, who seamlessly blends traditional Klezmer with American Funk, jazz and afrobeats. CATCH JERUSAFUNK AT CRESCENT BALLROOM FOR THEIR ALBUM RELEASE PARTY, THURSDAY JUNE 15TH. MORE DETAILS HERE. Since their formation they have entertained at some of PHX’s best venues and festivals. They’ve put on several charity shows to help struggling venues like Lawn Gnome be a place for people to come be themselves. Jerusafunk has also assumed the role of music directors and pit band for a live musical presentation of Jim Henson’s Labyrinth called The Goblin King’s City. The new album is a testament to the band’s dedication to wild, varying music. Having recorded and mixed much of the album themselves, it allowed them to achieve a very precise vision, and through blood, sweat and glitter, make it a reality. Alejandro Arboleda, a friend of the band from Columbia, was able to provide the charrango and quena on a couple of tracks. Jersufunk is a resplendent mix of heart and soul and a groovy sound that people of all walks of life can enjoy. The variety of music styles in the album is insane! From the Salsa-Samba vibe in “La cumbia bicuriosa,” “Perversenuss,” and of course “Mushroom Samba.” To the jazz club rhythm in “Stardust Lizard Fruit” and “Jeckyl’s Heckle.” Gateway movement and respect my lust are two of the funkiest tracks this side of the 70’s. “La Cumbia” is an enticing and passionate song sung Spanish that left me wanting to transcribe and google translate the lyrics. “Odessa” begins with a soundscape of horns and drums, then leads into a wonderful musical that makes you want to sit on a chair and a have few people hoist you up into the air as people dance around you. It’s a song that really emphasizes the band’s standing as “Phoenix’s first and only Klezploitation band”. “Jeckyl’s Heckle” is a track that exemplifies self-expression. It’s a song about digging deep into your wild side and doing what feels good. In “Jean’s Lost Scone Doina” we get jazzy horn interlude with an almost storytelling aspect reminiscent of Thelonious Monk noire. Clocking in at 9:25 “Saturnalia” is an ode to the ancient Roman festival of the same name. The festival is held in honor of the god Saturn on December 17th. Saturnalia is perfect music for cruising. It has such a vast array of instruments you get lost in the music only to be lulled in even further with enticing and colorful lyrics that also offers a message of freedom and discovery. The progression of the instruments is a real treat on this one and really exemplifies what the band is capable of. Perverseness is an anthem dedicated to sexuality, and it is glorious. The lyrics rally freedom of sexuality, and the horns and strings hypnotize you to believe every word of it. At almost 10 minutes, it’s a song you can really get down to… if you can last that long. Every track shows true appreciation for the genre they’re representing. PHX SUX is glad to have Jerusafunk as part of our community. We wish them luck on their 3 week east coast tour, and their eventual national tour.